New York, The Metropolitan Museum of Art, no. 52.124.2. Black chalk, 23.6 x 17.8, arched at the top; somewhat rubbed; slight touches of pen and ink and pencil as well as the brown wash of the background, and touches of brown wash in the folds of the drapery, are later additions; laid down; wm.? Inscribed in ink at the top: Rosso Fiorentino, at the right: Giulia Gonzaga Duchess[a] / di Mantoa, in the lower right corner: 93; on the verso in pencil, now covered by the backing: Le Rosso or Master Roux of Florence 1486/1541 1524. The absence of the “a” at the end of Duchezza indicates that the drawing was cut after this inscription was made; the 3 at the lower right is slightly cut, as well as the puff of the sleeve at the left and the sleeve at the bottom. The drawing is set within an elaborately decorated mat by John Talman (as identified by Hugh Macandrew; see Lugt 2462). On this mat are two inscriptions in ink. Immediately beneath the drawing is written: da [?] Rosso Fiorentino, and beneath the frame: Julia Gonzaca / Barbarossa the famous Turkish Pirate attempted to surprise this famous Beauty in order to make a Present of Her / to Solyman ye Emperour: & for that purpose landed by night 2000 Souldiers near Fundi where she then was, but at ye first alarm she mounting a Horse without any clothes but her smock made her Escape, at wch ye Barbarian was / so inraged that he burnt the Town; This Lady was the Widdow of Vespasian Colonna. Thuanus speaks much in her Praise. / Dictionaire de Moreni. Above the frame is written lightly in pencil and in another hand: Belange 56[?] c[?] Sir Joshua Reynolds. On the back of the mount is written: e collectione J. Talman (according to Bean, 1982, see below, this inscription has written above it: Rosso Fiorentino). PROVENANCE: John Talman (see under Lugt 2462 concerning the decorative border); Sir Joshua Reynolds (Lugt 2364); John Fitchett Marsh (Lugt 1455); purchased by the museum from H. M. Calmann, London, in 1952. Carroll, 1964 (1976), I, Bk. I, 172-176, II, Bk. II, 271-276, D.25, Bk. III, Fig. 81, as Rosso, 1527-1528. Jacob Bean and Felice Stampfle, Drawings from New York Collections. I, The Italian Renaissance, exh. cat., Greenwich, 1965, 53, no. 77, Pl. 77, as Rosso; the pen lines reinforcing certain contours as possibly additions by Rosso. Shearman, BM, 1966, 156, as Rosso, probably from his Roman years, and derived from Michelangelo’s teste divine drawings of the early 1520s. Walter Vitzthum, “Drawings from New York Collections,” BM, CVIII, 1966, 108, Fig. 60, as Rosso. Barolsky, 1978, 105, 150, as Rosso, and as showing his eccentric humor. Olszewski, 1981, 13, 26, 50, no. 25, 51, Fig., as Rosso. Bean, 1982, 227, no. 226, and Fig., as Rosso. Darragon, 1983, 47, n. 9, compares the coiffure with the Magdalen’s in the Sansepolcro Pietà. Carroll, 1987, 10, 25, 148-151, no. 50, with Fig., as Rosso, second half of 1527. Petrioli Tofani, 1989, 131, 138, n. 22, in relation to a copy by Il Poppi (see below). Costamagna, 1991, 54, Fig. 7, as Rosso. Franklin, 1994, 196, Pl. 154, 197, discussed with the female saints in the Christ in Glory, the lion’s head on her back noted as an attribute of Mary of Egypt. 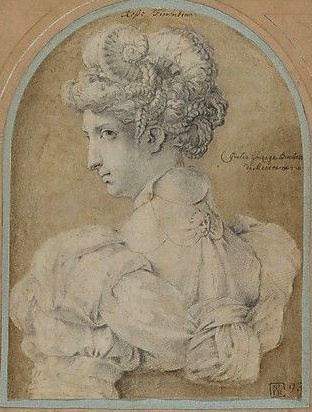 In spite of the fact that the drawing has been slightly reworked by a later hand, most extensively by the addition of a wash entirely around it, there is still visible enough of the original drawing to make clear that it is by Rosso. The few pen lines, pencil strokes, and washes in the drapery that have been added to accent certain areas have not too seriously concealed the original character of the drawing. 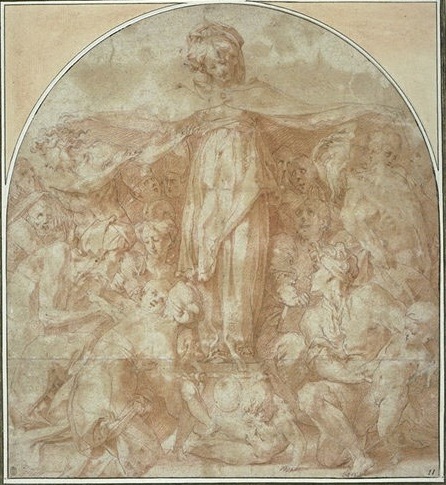 The head of the woman is similar to several heads in Rosso’s Sposalizio of 1523 (Fig.P.13a), the earliest dated work by him that shows the influence of Michelanglo’s teste divine drawings. Such elaborately coiffured heads appear frequently in Rosso’s paintings. The two in his Sansepolcro Pietà (Fig.P.19a) are the most similar to the head in New York. The way in which the drapery is gathered up in back beneath a high collar and is decorated with a broach is quite like that of the garment of the woman at the lower left of this painting. Both also have similar puffed sleeves, and both are seen the same way, diagonally from the back with the head in profile, although the drawn head gives a slight glimpse of the distant eye and eyebrow. The handling of the New York drawing resembles that of the Seated Woman in a Niche (Fig.D.11) in the patterning of the hair over the forehead into ribbon-like plaits. The drapery is similarly faceted and shaded with fine parallel strokes. 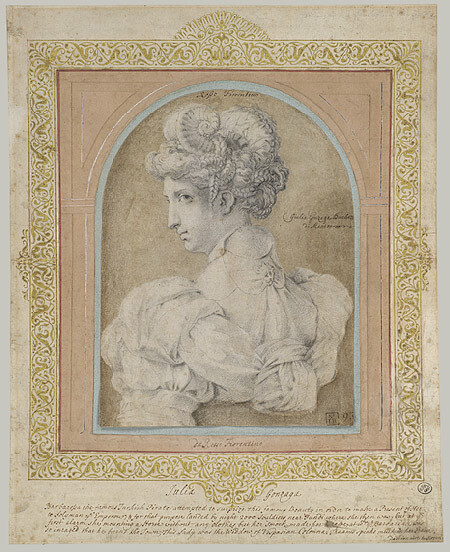 However, the Ideal Bust of a Woman is somewhat more softly drawn; the contrast between the lights and shadows is less intense, and the edges of details are less incisively delineated. Graphically, the drawing more closely approaches the Madonna della Misericordia of 1529 (Fig.D.35a), where the contrasts of light and shade are minimized and contours, although clear, are not sharp in order not to set them distinctly apart from the chiaroscuro. As what is described in the New York drawing is most similar to what is found in the Sansepolcro Pietà, it is very likely that the Ideal Bust of a Woman was done about the same time. Her features and coiffure resemble those of the Magdalen at the foot of Christ in this altarpiece, and the softly folded and knotted drapery across her shoulders and back is very similar to the turban worn by the man next to the Virgin in the painting. 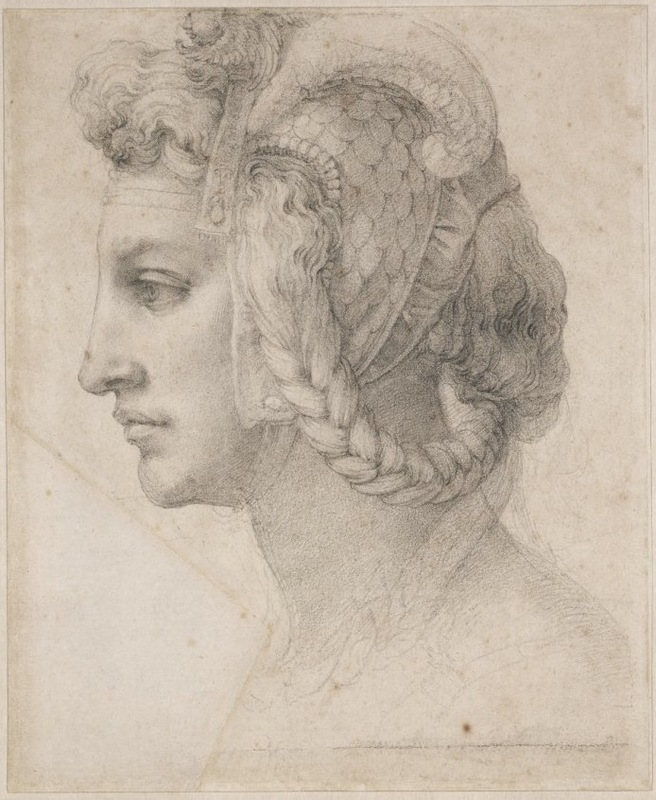 The drawing is also related to a drawing by Michelangelo in the British Museum (1895-9-15-493; see text; Fig.Michelangelo, London, Testa divina) that represents a similar idealized head with an elaborate coiffure into which is set a pair of horns. 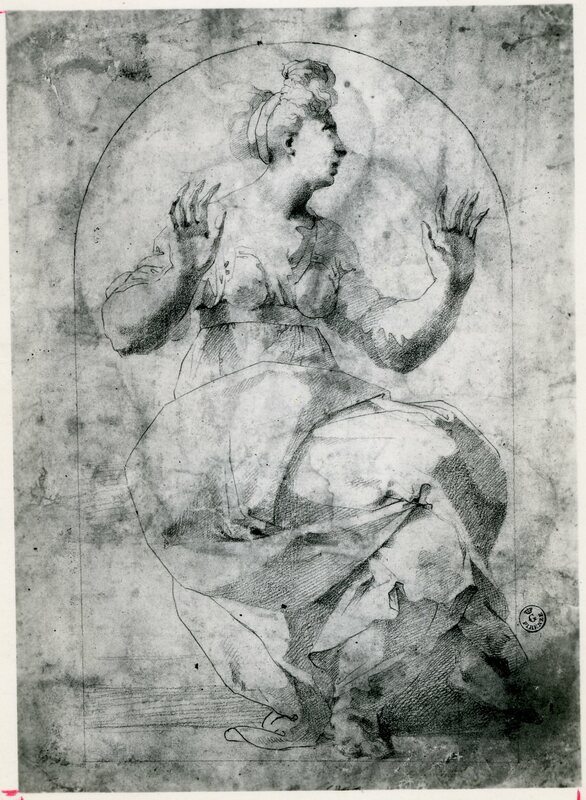 In places, as in the waves over the forehead, even the draughtsmanship is alike, indicating surely that Rosso had studied Michelangelo’s drawing or a similar one by him now lost, possibly during a trip to Florence in the second half of 1527 just before he settled in Borgo Sansepolcro to paint his Pietà (P.19). The Ideal Bust of a Woman may well have been done in Florence at that time or only shortly thereafter in Sansepolcro when he was beginning his altarpiece towards the end of 1527 where heads of such a similar kind appear. Shearman thinks the drawing was done in Rome but it has none of the largeness, robustness, or vitality of any of Rosso’s Roman works. The inscription in English on the back of the drawing indicating a date of 1524 cannot be considered to preserve a sixteenth century annotation on the drawing. None of Rosso’s drawings bears a date inscribed by Rosso. The drawing does not appear to be a portrait. 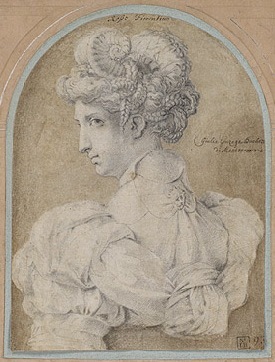 The episode involving Giulia Gonzaga that is narrated in the paragraph on the mount under the drawing took place apparently in 1534 (Maud F. Jerrold, Vittoria Colonna, New York, 1946, 204) when Rosso was already in France. There is no record of any connection between her and Rosso. One might wonder if the inscribed 1524 is the date that Talman thought Giulia Gonzaga’s adventure took place. I am not sure that the ornament on the back of her dress is a lion’s head, as Franklin thought. Nothing else about her points to this figure as representing a saint. 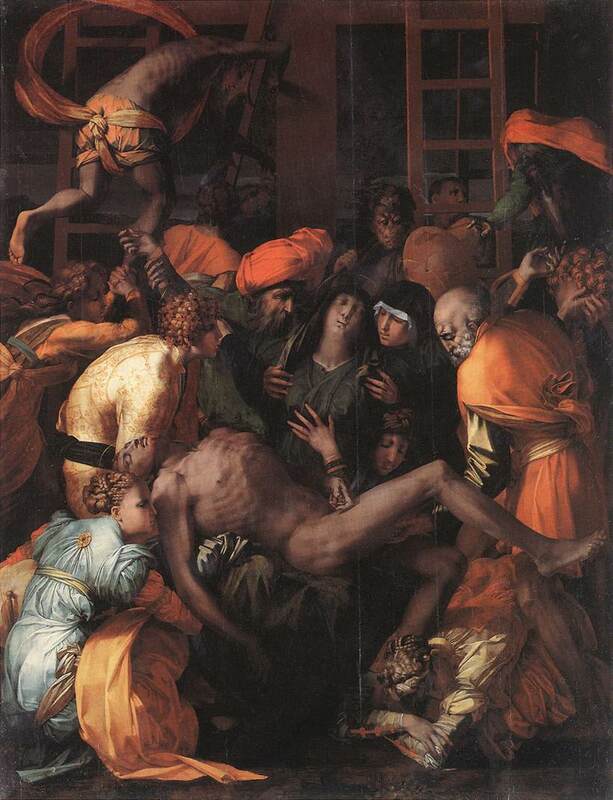 COPY: Florence, Uffizi, no. 4264F. (Fig.Poppi, Florence, 4264F). Black chalk, with traces of red chalk, 13 x 9.3; laid down. Petrioli Tofani, 1989, 131, 138, n. 22, as by Il Poppi. Giovannetti, 1991, 34, no. 29, 76, Fig., as by Il Poppi after a Rossoesque drawing in the Metropolitan Museum of Art. Franklin, 1994, 290, n. 66. Giovannetti, 1995, 218, D27, Fig. 28, as after Rosso’s drawing. This sketch show very little more of the arm and back. 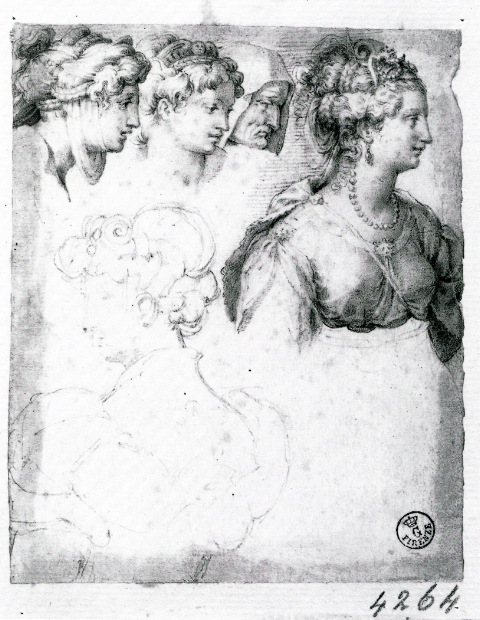 It is on a sheet of other heads of beautiful women with complex coiffures in a group with the head of an old woman from a picture once attributed not to Poppi but to the circle of Vasari, and another richly coiffed woman related to a painting by Poppi in Florence on which, see Giovannetti, above. 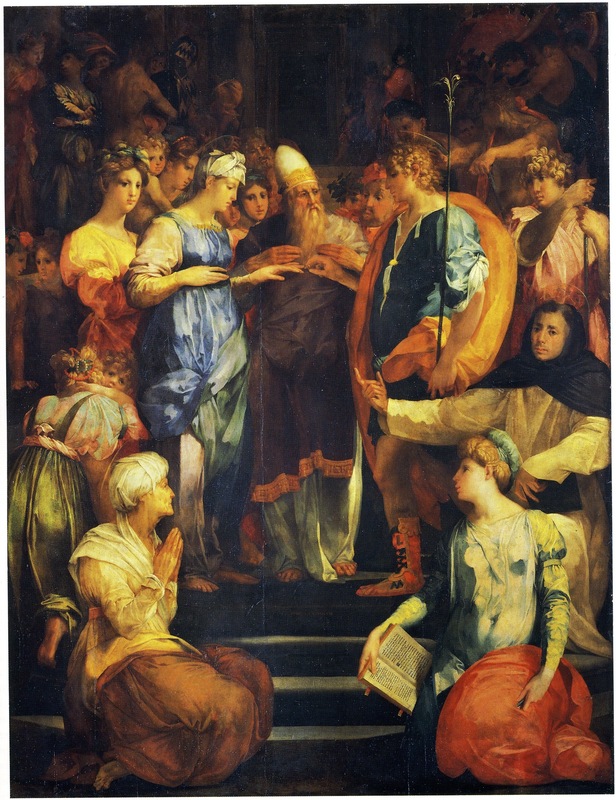 Herein a conclusion might be reached indicating that Rosso’s drawing was done early on in Florence.